Three slots left in the semifinals. Which of Friday’s players will lay claim to one? Click here for my preview. Mark showed why so many players were afraid of him. He’s got the lead; little do our contestants know that they can each just wager zero and advance! Let’s break this down, because were this a “real” game, it’d be quite interesting. Mark should wager 5,701 to cover Jared. Jared can wager up to 1,600 to stay above Mark if they’re both wrong, and Sandie can wager up to 800. Jared could wager 8,201 to cover Sandie. Sandie should cap her wager in response at 7,400 to ensure she finished ahead of Jared for the wild card. Jared should wager at least 4,100 to cover a zero wager by Mark. 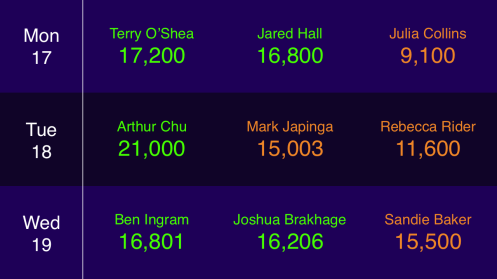 Sandie should wager 4,900 to cover a zero wager by Mark and 800 to cover a zero wager by Jared. The thing about Sandie’s position is that were this a do-or-die game she should wager 800 exactly – enough to tie a zero wager by Jared while staying above a lockout wager by Mark. 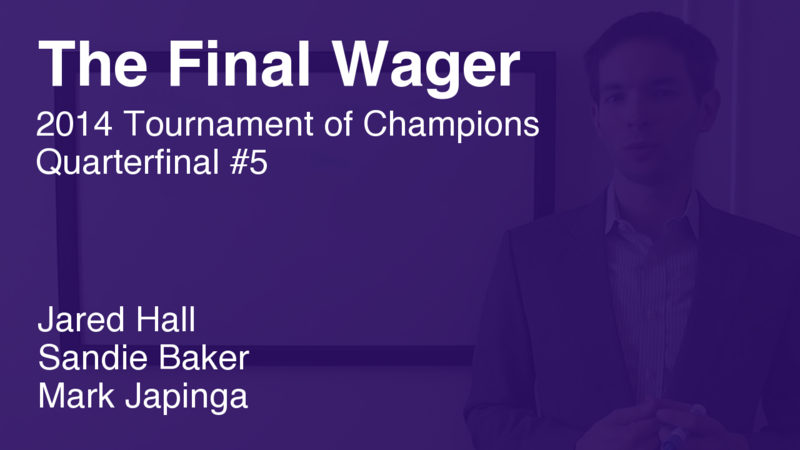 Mark, therefore, has the option of wagering for the tie just in case. Jared could wager zero or everything. Too bad we don’t get fun situations like this too often! If Jared wagers 1,600, his total will be 11,400. In response, Mark might cap his wager at 2,499. Poor Mark had to wait all of 30 seconds to discover that, yes, his $15,003 was sufficient to claim a wild-card berth. Unfortunately for them, Rani Peffer and Jim Coury are knocked off. They are the only two players to respond correctly to a Final and fail to advance; Julia Collins was the only one to miss Final and still make it. Here are the match-ups for the semifinals. I think this is the first time I’ve seen where all of the winners’ scores were higher than the wild cards’ scores. *note I previously had the Monday and Tuesday games flipped – sorry about that! Thanks to Julia for setting me straight. Who are Hänsel und Gretel (by Engelbert Humperdinck)? Keith, do you know how they would break a tie between 2 wild card players, particularly if players from 2 different matches ended up tied for 9th? Is that already on the site somewhere? Sorry for asking if it is. P.S. The first tiebreaker rule (higher pre-Final score) has been applied twice: In the 1996 Teen Tournament (tie at 9,000 pre-doubled) and the 2003 ToC (two players with a zero score got wildcards). The second tiebreaker rule (higher first-round score) has never had to be applied yet. What I said assumes that it didn’t happen in any of the early tournaments that aren’t archived and which I don’t have sufficient data for. Kelly’s got it – I touched on it briefly in my video on tournament structure.